Bee Ed is a not-for-profit business started in 2010 to provide information and education about pollinators, particularly bees. We run courses, give talks, visit schools and attend open days to offer education about bees. Bee Ed events are based at Brigsteer Bee Reserve but we also travel (with our bees) to run courses elsewhere and give talks. Income is used to fund development of the bee reserve. Brigsteer Bee Reserve is a private wildlife reserve on the west-facing slope of the Lyth Valley in Cumbria. The valley faces south towards Morecambe Bay and is part of the Morecambe Bay Wetlands Project; the Lake District Fells form the backdrop to the north. The land was purchased in 2007 and the 17.5-acre reserve is made up of limestone pasture, meadow and woodland. The huge old hedges are being renovated, boundaries made good and fenced to control winter grazing; a small area of woodland is being planted with trees used by bees for nectar, honeydew and resin for propolis. 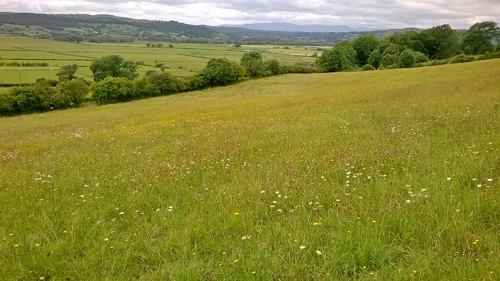 The grassland is managed to favour a flower rich flora and to provide nest sites for bumblebees and solitary bees. There is a small teaching apiary with honeybee hives. Beekeeping courses run during the late spring and summer approximately one weekend per month. Bee ID days run on an ad hoc basis and in association with Friends of the Lake District. We offer ‘Meet the Bees’ afternoons for people who would like to just understand more about honeybees and see inside a beehive. Brigsteer Bee Reserve looking north.